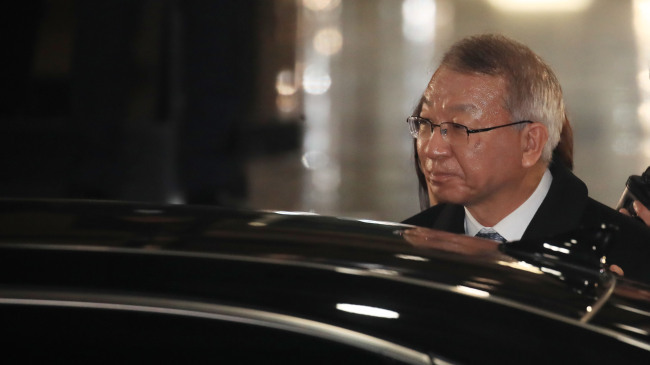 Prosecutors were expected to decide whether to issue a warrant to detain former Supreme Court chief justice Yang Sung-tae after their third interrogatory session with him Tuesday over his alleged involvement in a power abuse scandal. Yang was summoned to the Seoul Central District Prosecutors’ Office Tuesday morning for more questioning and to go over records of their cross examination. Prosecutors suspect that the National Court Administration, under Yang’s instructions, sought to use politically sensitive trials as bargaining chips to win former President Park Geun-hye’s support for his long-cherished wish to establish a new court of appeals. During their earlier sessions with Yang on Thursday and Monday, prosecutors grilled him on some 40 charges. On Tuesday, they were to question him about allegations that he amassed slush funds with the budget set aside for running court spokespersons’ offices. After the questioning session on Tuesday, Yang was set to go over his statements that prosecutors had taken. Yang has flatly denied most of the allegations, and said he does not remember certain things. On charges for which the prosecutors presented physical evidence, he said, “working-level staff took care of it” or that his actions did not constitute a crime. Prosecutors are expected to decide on whether to issue a warrant for Yang this week. They may also issue warrants to detain former Supreme Court justices Park Byung-dae and Koh Young-han for a second time after the court denied the warrants early last month.